If your Facebook feed hasn't made it obvious enough: it's Valentine's Day! For my holiday manicure, I chose to go with something sweet and cute but with a little bit of quirk. Enter the perforated leather technique, which I first showcased in my Lacquer Legion post. It certainly looks different in pink, but honestly I am still just as in love with this now as I was then. A silver texture finishes off the look with lots of sparkle. 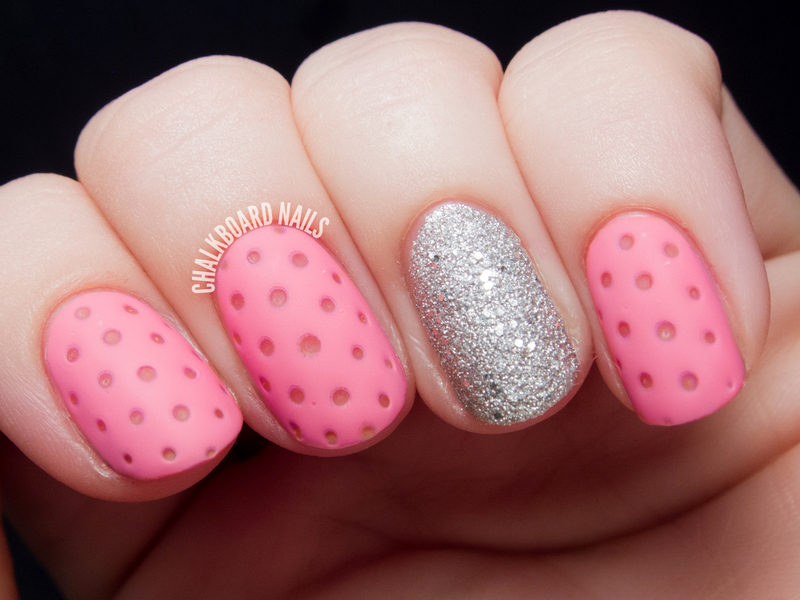 For the perforated leather nails, I used OPI Kiss Me I'm Brazilian from the Brazil Collection. I tried to pick a pink shade that would be plausible as leather, if that even makes sense, and I think this one worked nicely. If you want to try the perforated leather look for yourself, be sure to read my step by step (which I've updated with a few new tips and tricks) to get the details. The matte topper I used is OPI Matte Topcoat. The accent nails are two coats of OPI It's Frosty Outside, a silver texture from the Mariah Holiday Collection. Honestly, it's gotta be in my top five texture polishes to date, maybe even top three. It glimmers in the light and has the perfect amount of roughness. Without waxing too poetic, it reminds me of a giant pile of thousands of diamonds. Wishing you all a wonderful Valentine's Day! For those of you without a romantic Valentine, take the day to express your love to your family and friends, and give yourself some love, too! Don't forget, you can always grab one of my Valentines for nail polish addicts and tell them how you really feel. These are very cool! I love that its edgy but girly at the same time. Happy Valentine's Day! Super cute! I really love the perforated leather look. It's definitely something that I want to try the more I see it. It reminds me of candy in the pink! Love love these!! I'll have to try the technique sometime! I want to try doing this texture for myself even more now that I've seen your pink version! That manicure looks simple yet very romantic and different. I'll definitely try this some time! I dig it :D happy Valentines day to you! Hello and a very nice weekend! Sush lovely nails, special way making them. My daughter also make beautiful nails. You have the best ideas! Such a cool concept I really like it in pink. i love the perforated leather look! both of those polishes are beautiful! These are so girly yet edgy!